www.insuranceinspain.com can provide all types of cover for your Motorhome, from Third party liability with windscreen and breakdown recovery up to Fully Comprehensive. Many of our clients travel around Spain for weekend trips, weekly trips and some spend the whole year driving around the country in their Motorhomes and campers in the knowledge that they are fully protected should anything happen. Driving a motorhome or living in a caravan and/or towing a caravan in Spain can be a very rewarding and novel experience. Insuring your caravan, whether it is a small trailer type pop up tent, larger multi-berthed luxury sleeper, a Motorhome or a static caravan, horsebox, garden trailer or boat trailer, www.insuranceinspain.com has the required insurances to suit your needs. There are a large variety of Motorhomes on the market and we can provide you with an insurance to suit your needs and specifically for your motorhome. These are often expensive vehicles and we take the time and care to ensure that you are properly protected.There are many Motorhome users in Spain and Portugal and they are becoming ever more popular as a cheap means of accommodation and a good way to see Europe. They offer facilities all year round and many campers and Motorhomes owners spend the winter in Spain as they enjoy the climate. It can be very hot in summer, but then that is why most people visit Spain. However, there are a lot of mountainous regions in the north of Spain that often provide a respite from the heat and there is so much to see and do. Every village in Spain has some sort of fiesta during the year, often each village will have a separate date so as not to coincide with the next village so there are on-going fiestas that can last a day, a week, or even a month. It is worth checking calendars of events and if this is your thing, you will be kept busy and find routes that give you plenty to do and see. Spain has a network of camping sites, Motorhome stopover points and what they call Aires de Service that are often free or make a small charge if you are linking up to electricity or water. These charges are nominal, usually between 5€ and 10€ for 24 hours. Some do provide services for emptying cassette toilets and water waste, filling up with water and getting rid of your rubbish. Most charging sites also have shower facilities and restaurants and bars. Most of these sites are considered safe areas. Motorway services also provide stopover areas, fuel and coffee shops with services for showers and food. Spanish motorways are subject to tolls and these can be quite high in places. There are alternative routes but they can be slow and often heavy with traffic in the summer as the Spanish are not keen to pay motorway tolls. The A roads can become slow but if you are not in a hurry, then taking non-motorway routes can be exciting and rewarding. There are hundreds of local villages and exploring them is fun, just be careful about driving into the centre of some of these small villages as the roads can become very narrow with 90 degree, sharp bends that are difficult to navigate. If you are going to be doing a lot of motorway travelling in Spain, or are a regular visitor, then it is worth getting a VIA-T Box, which will allow you to drive through the tolls without having to stop to collect a ticket and pay at the other end. The VIA-T system automatically takes the payment directly from your credit card or bank account. The motorway toll areas have specific lanes for the VIA-T users and in the summer months can save you a lot of time by not having to queue up at the normal Toll Booths to pay. It goes without saying that if you are travelling in a Motorhome make sure you have all the relevant documentation. Vehicle registration, driving licence, passports and insurance are required and you will need at least two road warning triangles (compulsory) and we would recommend having a visibility Vest for each person in the vehicle. If you step out of the vehicle on the motorway it is compulsory that one be worn. On-the-spot fines are common and must be paid in Euros immediately or you run the risk of your vehicle being confiscated. If you do not have enough cash, then the Guardia Civil, local police or traffic cops may allow you to go to a bank vending machine to withdraw what you need. They will of course, accompany you. Speed limits are lower in Spain for Motorhomes up to 3.5 tonnes than cars. It is a maximum of 100 km/h on motorways and dual carriageways, 90 and 80 km/h on 1st and 2nd category roads. Fixed speed traps and temporary speed traps are everywhere so don’t try speeding. 20 km/h over the speed limit can net you a fine of 300€ or more. Carrying bikes and scooters on the back of your motorhome is acceptable in Spain providing the additional length is no more than 10% of the length of the vehicle and you must display a ¨hazard¨ warning plate that is 50x50 cm. This must be attached to any overhanging item such as a bike or scooter. All persons using bicycles under the age of 16 must wear an appropriate helmet. If you are towing a small car behind the motorhome on a trailer, the trailer must be a four wheeled trailer, not one on an A frame. Height barriers can be an issue, but Motorhome parking is generally very good. There are lots of open areas and in some villages, towns and cities, there are areas designated for Motorhome parking which is often self evident by the fact that numerous vehicles are parked in the same area. Motorway services and petrol stations are abundant and you should not have any issues with finding fuel. Diesel, petrol and LPG prices are usually the lowest in Europe although they do tend to rise slightly in the summer months. Butane and propane are readily available at service stations. It is generally considered very safe in Spain. Campsites and official sites have good security but don’t take any unnecessary risks, lock your vehicle when it is not attended. Spain has become notorious for highwaymen! These so called highwaymen try and get you to stop by flagging you down or indicating that there is a problem with your vehicle. Do not stop unless you feel there is a problem with your vehicle or unless a Police official is stopping you. Try and get to the next services or stop in an area where there are likely to be people about. Keep your handbags, money, keys, passports and mobile phones close and lock all the doors. As with all things, having a safe and pleasant journey and enjoying your holiday or trip is what you want to do. Make sure you have the correct insurance. In the event of something unexpected happening, you are protected. NEWS:- Read the latest news on Motorhomes in Spain. Travel insurance has always been a good idea. Medical treatment for accidents and injuries can be expensive. We can supply you with local or international travel insurance for the whole family or individuals. These can be annual or specific trip policies. Call us for details. In Spain, we can also provide you with a very cheap personal accident & injury insurance policy that will cover you for accidents and injuries whilst travelling in this wonderful country. 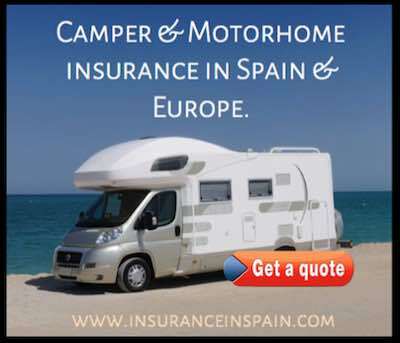 Call www.insuranceinspain.com on 0034 965 27 57 27 and will be happy to advise you on Motorhome insurance in Spain as well as any other form of insurance you might require.